Our poor chickens. We don’t move them as often as we did in the spring and summer. There is really no fresh vegetation for them to munch on. Our kitchen scraps have been reduced to lettuce stubs, the occasional tomato and squash rinds. The majority of the girls do not seem too disgruntled with this confinement. We let them out most days so they can roam around and pick and peck at whatever bugs and seeds are left on and in the ground. 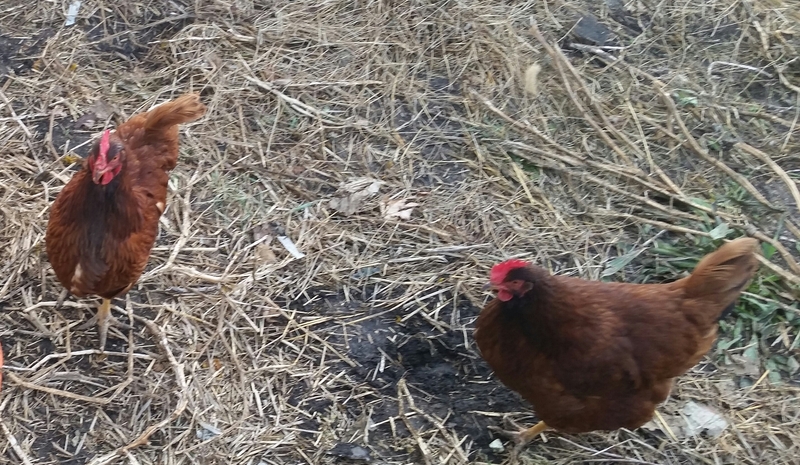 At first, they stayed pretty close to the coop, afraid to be left out and eaten by a fox or coyote. But, after a time, they started to wander farther. 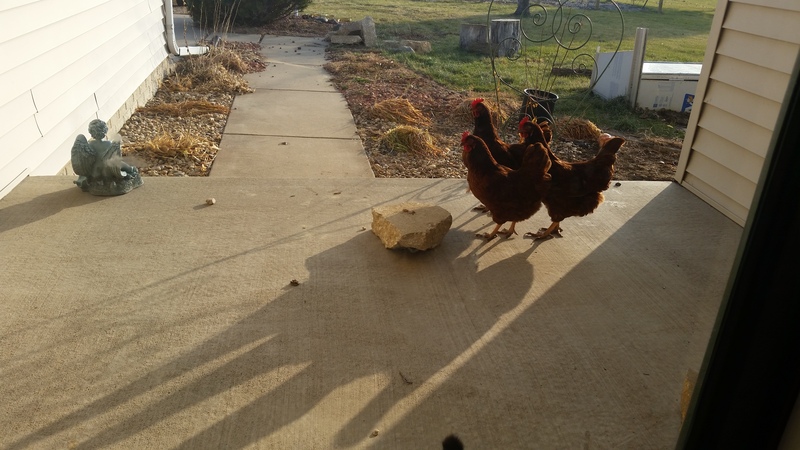 One sunny day, we heard them pecking at the front door. Another day, rainy this time, we found one on the back deck, strutting around and pecking at the wood. 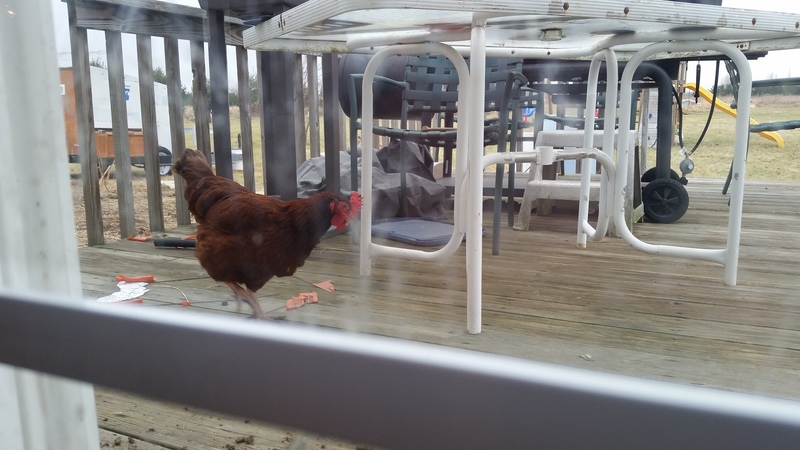 I went out to shoo her off the deck, not wanting chicken poop everywhere, and she just looked at me, unafraid and daring me to make her move. I suppose it is a good thing they aren’t afraid of us anymore. And it’s a good thing that, instead of running away when we pick them up to put them back in their playpen, they squat, bracing themselves for the impact…rather than trying to peck our hands. They have now covered the entire kitchen garden, ravaging all vegetation and pests. I’m quite proud of their determination to rid the soil of anything that moves. And, I’m excited to see how well they’ve prepped the soil for next season’s garden. The first time we let them out to roam, they found a spot up near the house to take a dust bath. Dust may seem an odd choice in soap, but it helps to remove parasites and clean feathers and skin. After their bath is over, they strut around preening and clucking…showing off their shiny feathers. It’s fun to watch them and hear them making noise, usually telling each other off when there isn’t enough room for all of them to bathe.